I‘m a 26-year-old living alone in a studio apartment on Russian Hill. I’ve lived here for just over a year (~13.5 months), and like clockwork, as soon as my 1-year lease was up my rent was raised 0.5% from $1,600/month to $1,608/month. Fine, big deal. A month and a half into this new rent increase I received a letter from the city notifying me that my landlord has petitioned to raise my rent by the maximum 7% allowed as an operating and maintenance expenses passthrough. Obviously I’m not too happy about this and the prospect of paying $1,720/month for a studio apartment is stretching my definition of sanity. A little bit about the building- it’s a 17 unit apartment building built in 1928. During my initial lease period the building changed ownership and management companies. The letters I received from both the old and new management companies specify a changeover date of 1/1/2011 while the petition application lists the current owners as owning since 12/31/2010- I’m not sure if this is relevant or not. The petition claims a total increase of O&M costs of roughly $127,000 from year 1 to year 2. The bulk of these costs are from a $9,000 increase in water/sewer, $25,000 in property taxes, and $88,000 in debt service (the previous owner apparently had no mortgage). My main gripes are these: 1) how can this new owner claim increased operating costs year over year when they haven’t even owned it for a year? Do they get a credit for what the previous owners paid? The Years are one 6/1/09-5/31/10 and two 6/1/10-5/31/11, giving this owner only 5 months of ownership in this two year period. 2) Can the owner really expect to pass the bulk of his mortgage and property taxes on to the tenants? It just doesn’t feel right. This whole thing seems to violate the spirit and intent of every rental protection law that San Francisco has on its books. If there were a genuine increase in O&M expenditures- increased garbage and water costs, maybe new carpet in the hallways, new windows, etc.- then I would be more open to this. I know the laws are there to protect landlords in addition to tenants, and I understand the reasoning for taking into account debt service in these passthroughs, but can it really apply to a new owner? The whole thing just reeks, especially coming on the heels of my first “regular” annual increase. I know I can protest the increase at the hearing which is TBD. But do I have any legal arguments here or will the rent board just happily listen to my protest at the hearing and then just as happily approve the owner’s petition? I don’t see anything in my lease about operating and maintenance expenditure passthroughs. I also haven’t heard anything from the landlord about their intent to increase the rent and am wondering if I should get in touch with the management company and just talk to them. I’m willing to work with them and am open to a small increase to offset their costs. I also have not heard anything from my neighbors. The petition applies to 13 of the 17 units in the building (the rest of which I assume are under a new lease or vacant). Should I talk to the tenants of the other units facing an increase? Will a protest be more effective at a hearing with more of the tenants present? It ain’t a new world. It’s the real world. 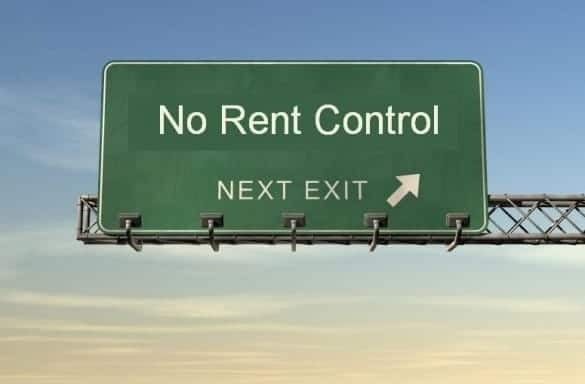 In the real world, in Bakersfield or any other jurisdiction without rent control, a landlord would not have to justify your rent increase at all. In Redwood City you would not have the opportunity to ponder the financial machinations of the landlord business that allow them to do what few business people can–arbitrarily increase the price of their “service” based upon expenditures that they will eventually write off on their taxes. It’s the ol’ double dip. Free market capitalists will point out that all businesses can choose to raise their prices anytime they want. That’s true, but in a truly competitive marketplace, a business that arbitrarily increases its prices risks losing business to others who are more competitive. As I said last week, “free market” thinking cannot apply to land, especially land in San Francisco. Land is ultimately a finite commodity. San Francisco is an instructive microcosm to understand the effects the “free market” on a commodity that is finite. Housing costs are always pegged to the price of land. As demand increases, the value of the land and the housing situated upon it increases. Imagine a world in the future in which population has increased so dramatically that human beings live on every habitable plot of land on earth. Of course the land will be owned by a very small percentage of landlords. Those landlords will literally have a captive market. Nobody will be able to move to Oakland where the rents are cheaper. Obviously that scenario is a long way off, but cities like San Francisco are the canaries in the coal mine. When a natural resource like land is treated like a commodity, the future is ominous for tenants first and then the landlords upon whom tenants vent their anger. First, the comparison of expenses from old landlord to new is allowable, notwithstanding that all of the increases in expenses were calculated and considered by the buyers and factored into final sales price of the building. In other words, the purchaser knew what he was buying, may have received a reduced sales price and now gets to charge a part of the theoretical cost to you. It chaps my hide when I see debt service costs charged to rent controlled tenants. Again, a speculator who knows he’s paying far too much for a building will still buy it, banking mostly on upside created by more speculators like him, but still understands he can charge part of the cost of debt to the tenant. All of this is legal and, indeed necessary, to avoid constitutional challenges to rent control ordinances. Courts have, time and again, decided that landlords must be able to get a fair return on their investments. As I said last week, the United States Constitution made property rights sacrosanct. I read last week’s comment from cedichou with interest last week. Addressing the the problem of finite supply and infinite demand, cedichou said, “[W]ill ensure that rents go up. Rent control cannot stop this. The perverse incentive of rent control is to artificially hike the rents of open units so as to anticipate as much as possible upfront the later impossible rent increases.” That’s absolutely true. So what can tenants do, short of advocating to amend the United States Constitution to add a right to housing? (Not a bad idea in itself.) In California, tenants should be demanding that their legislators, with an email every second of every day, repeal the Costa Hawkins Rental Housing Act (Civil Code section 1954.50 to 1954.535), a law passed by so-called conservatives, which among other things, prevents local communities from establishing price controls on rental housing. To prevent the disparity cited by cedichou, local communities should be able to control prices on every single rental unit if they so desire. On another note, there are absolutely no studies, of which I am aware, that break down the demographics of landlords. From my own anecdotal evidence Mom and Pop landlords are a thing of the past. Sure, there are landlords who own a single building, but in many cases kindly old Mom and Pop died and the greedy kids either sell the building to a speculator or mercilessly harass the rent-controlled tenants to get out. The debate over rent control, essentially a debate over private vs public control of natural resources, will be a defining issue of our time. I firmly believe that no one can call themselves a progressive if he or she is also a landlord. Let the Democrats have them. As I said last week, you should check out the OCCUPY related activities sponsored by the San Francisco Tenants Union. And don’t forget to join the worldwide general strike on May 1. “From my own anecdotal evidence Mom and Pop landlords are a thing of the past.” he writes above. this is absurd. hang out in any neighborhood and one finds that probably most owners are mom an pop, owned the small apt building for years, sometimes a couple of generations. Often, the buyer was working class, scrimped to buy it and now must deal with greatly reduced profits from new laws grandfathered in after they bought. As far as anecdotal, if fairness was an issue, the city would advocate “means testing” My anecdotal evidence is many tenants keep their low rent apts, long after they need landlord subsidies. But, who doesn’t like a bargain? why should someone making $200K and up a year have a rent controlled apt. Or, those with large assets, and/or owning real estaate – in the city or elsewhere. if the apt is their primary residence, the landlord has to subsidize their rent. One other perverse result of rent control is that you end up with people living in unsuitable properties because it doesn’t make economic sense for them to move. Recently I looked at a 2-unit building in Bernal Heights. One unit had 3-bedrooms and 2-bathrooms. There was only 1-person living there, paying $500pm. In a more normal market his rents would have increased, and he’d have made a decision as to whether he wanted to pay more in rent or move to a smaller apartment, and pay less rent. Such a process would free up larger apartments for families to occupy. The downstairs had similar rent, with a few people living there. Based on the rents that building was worth about $200K. Clearly it was worth much more, but to get at that value the only option was to buyout or evict the tenants. At some point tenants should realize they’ve shafted their landlord for long enough, and their rent has been subsidized so much that now the landlord’s only option is to go the TIC route–another perverse result of rent control. I have read several of the pieces here and find the legal advice helpful. On the other hand I find the editorializing wrong, unhelpful, stupid and often insulting. Having said that I do understand how a tenants’ attorney would have a negative view of landlords. But the fact that one only hears about bad landlords, and only from the tenants’ perspectives, does not make a good basis for commenting generally on SF landlords. Somewhere around half a million people are housed by landlords in SF. How many of them are actually seen by attorneys because of problems. Rent control and eviction control laws are much too restrictive in SF. How does it make sense to limit rent increases to less than inflation? Rent increases are now lower than increases on property tax. Insurance and maintenance aren’t limited. Why do all tenants, regardless of income, get rent control? Why can tenants get all sort of increases in their income, but landlords are limited to 2/3 of inflation? This sentence is wrong, “The perverse incentive of rent control is to artificially hike the rents of open units so as to anticipate as much as possible upfront the later impossible rent increases.” You can only hike rents in line with supply and demand. You can’t artificially hike them or they won’t rent out. The way to lower rents is to increase supply. You can increase supply by not having such crap eviction and rent control laws, and encouraging owners to put in inlaw units. Second, Costa Hawkins was passed with the support of a large number of Democrats. Democrats have been as uninterested in tenants’ rights as Republicans in California.